Mr. Swan busking, a thing swans do to look twice as large and threatening. Cape Ann’s beautiful blue-eyed swan is doing quite well especially considering he is at least 28 YEARS OLD. It is highly unusual for a Mute Swan to live that long. Wild Mute Swans live on average eight to twelve years. In captivity, they can live up to 40 years, but our Mr. Swan hardly lives the cushy life of a Queen’s swan. . He is only occasionally a little gimpy on his bad leg. Mr. Swan still manages to rule most of Cape Ann’s waterways, from the Annisquam River to Rockport Harbor, and everything in between. 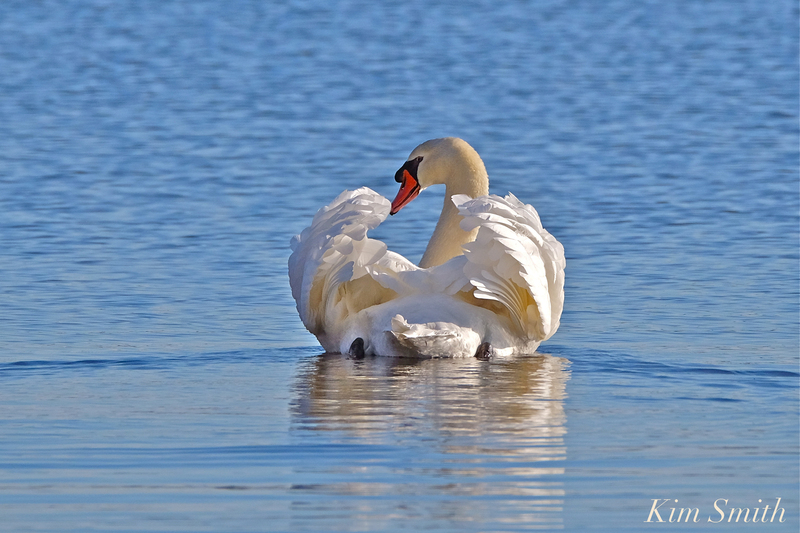 This entry was posted in Birds, Birds of New England, Cape Ann Wildlife, Eastern Point, Swans (Cygnus olor) and tagged Beautiful Birds of Cape Ann, blue-eyed swan, Cygnus immutabilis, Cygnus olor, Mr. Swan, Mute Swan on November 15, 2018 by Kim Smith.